Witch Pete. 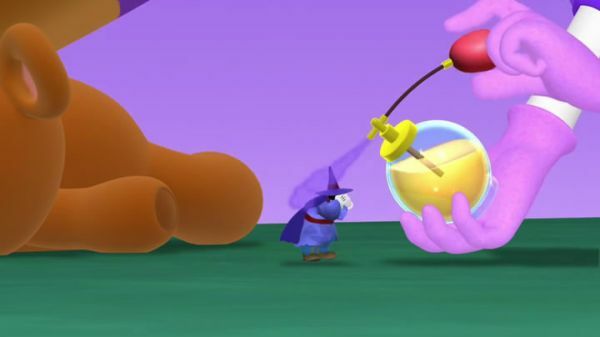 DAISY: Let's use the Professor's fritzer-spritzer spray that makes things grow. We're gonna spritz, spritz, spritz, spritz him up like this. MICKEY MOUSE: Hot dog! It worked! PETE: Oh, thank you, thank you. That feels much better. Nothing like being a big witch again. Now then, exactly how many Rapunzel Flower petals do you need? DAISY: How many? Twelve. Right. PETE: Well then, that's one dozen Rapunzel Flower petals coming right up! DAISY: Count the petals with us! ALL: One, two, three, four, five, six, seven, eight, nine, ten, eleven, twelve. DAISY: That's a dozen. 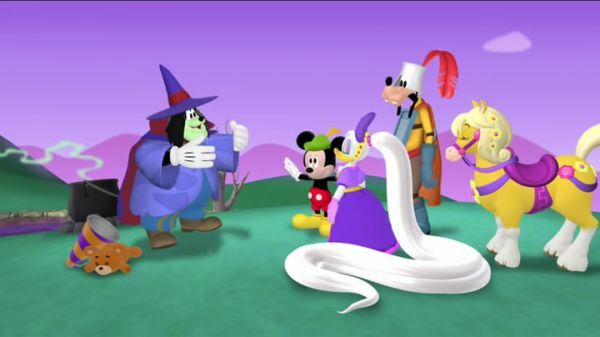 MICKEY MOUSE: Thanks, Witch Pete! PETE: Well sure thing, my fairy-tale friends. 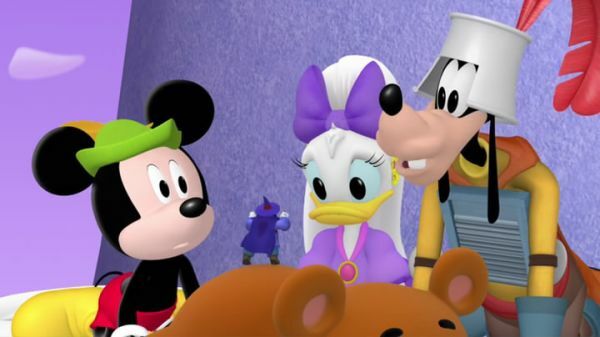 MICKEY MOUSE: Come on, let's get back to the Clubhouse! DONALD DUCK: Fa-la-la, la-la-la, la! CHIP AND DALE: Princess Daisy is so fair. Now let's go back and fix her hair. PROFESSOR VON DRAKE: Whoo boy! You made it back from the witch's tower all the way. 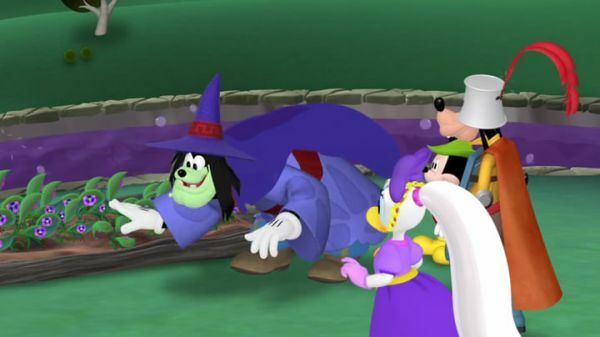 DAISY: And we got one dozen Rapunzel Flower petals. Here, Professor. PROFESSOR VON DRAKE: Whoa, beautiful. Now let's adding the petals to my fritzer-spritzer spray potion, would you? Let's better hoping it works. Spritz with me, would you please? We're gonna spritz, spritz, spritz, spritz it up like this. Spritz, spritz, spritz. MICKEY MOUSE: Oh... DAISY: It worked. ALL: Hooray! PROFESSOR VON DRAKE: Whoo boy! That's better. That hair do really is you, isn't it? See, the Professor is still a genius of some kind. DAISY: Oh, goody-goody! I love happy endings. Thank you all so much for helping me fix my hair. Oh, how fun! MICKEY MOUSE: Now let's have some more fun. Come on, everybody. Stand up and do the hot dog dance!